At Frontier Imaging, we have one of the broadest selections of compatible, remanufactured and OEM printers, copiers, & fax supplies supported by many great services. Our inventory is constantly growing and we want you to be updated! 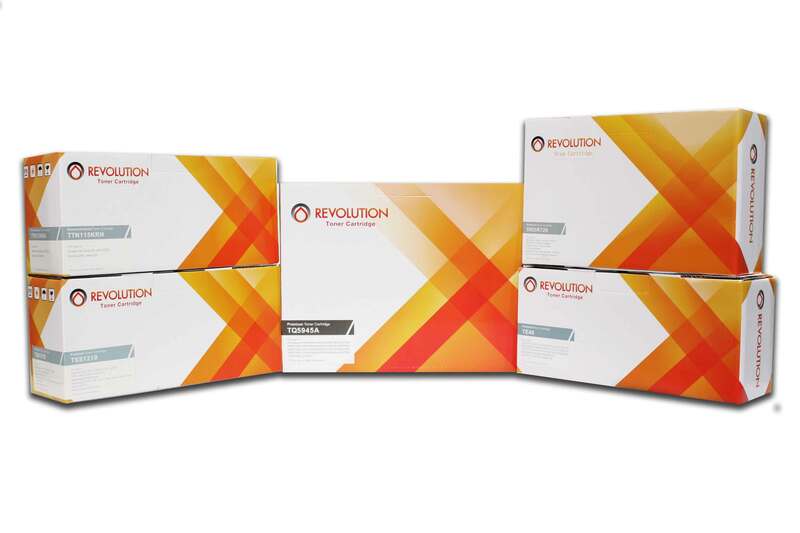 Revolution is our line of premium compatible and remanufactured toner/ drum cartridges, which are manufactured with the latest technology to ensure the highest print quality. They are a low cost, high quality substitution to all your OEM needs. By using rigorous guidelines for quality control, Revolution cartridges are ISO 9001 & IOS 14001 certified. Each cartridge provides a level of performance equivalent to OEM standards with savings of up to 60%! Our remanufactured line of Revolution toner is made from recycled cartridges to help reduce waste and protect our environment. We provide a 100% satisfaction guarantee, delivering you the best overall value! Looking for the right Revolution Cartridge for your machine? You can easily find the cartridge you are looking for by going to the search bar at the top of this page and typing in “Revolution” followed by the cartridge or complete model number for your machine. You will be amazed at our large assortment of SKU's.